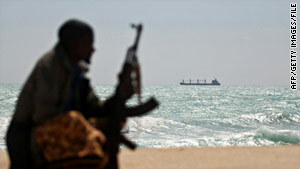 A Somali pirate watches a hijacked ship just off the Somali coast in January. (CNN) -- A pirate was killed and several others were detained after a security team thwarted an attack in waters off Somalia, authorities said Wednesday. The incident happened Tuesday as a Panamanian-flagged cargo ship, the MV Almezaan, was headed to Mogadishu, said the European Union Naval Force. A private security team that was on board the ship returned fire when pirates tried to attack the vessel. The security team was able to repel two attack attempts. The EU naval force was called in, boarded the three pirate ships and detained six suspects. They also found one pirate who had died of a gunshot wound, the naval force said. No further details were immediately available about his death. The waters off the Somali coast -- the Gulf of Aden and the Indian Ocean -- have been plagued by Somali pirates. The international community has adopted measures such as escorts and monitoring to crack down on piracy. Two cargo ships were seized in the area on Tuesday, the EU naval force reported. Hijackers took control of one ship in the Indian Ocean and were apparently taking it to Somalia, EUNAVFOR said. The MV Frigia, a Turkish-owned and Maltese-flagged cargo vessel, had been headed east from Port Said in Egypt to Kaousichang in Thailand. The ship was moving west and appeared to be heading toward one of the so-called pirate ports off the coast of Somalia. There are 21 crew members on the ship, 19 Turkish and two Ukrainian. Also, the Bermuda-flagged and Virgin Islands-owned MV Talca was hijacked in the Gulf of Aden, EU NAVFOR said. That hijacking took place off the coast of Oman and 180 miles south of Mazera. The ship had been heading from Sokhna, Egypt, to Busheir, Iran. Twenty-three crew members are from Sri Lanka, one is from the Philippines and another is from Syria.